The Stand Up To Cancer Cycle Challenge team called at Cambridge on the final leg of their 500-mile Glasgow-London ride. 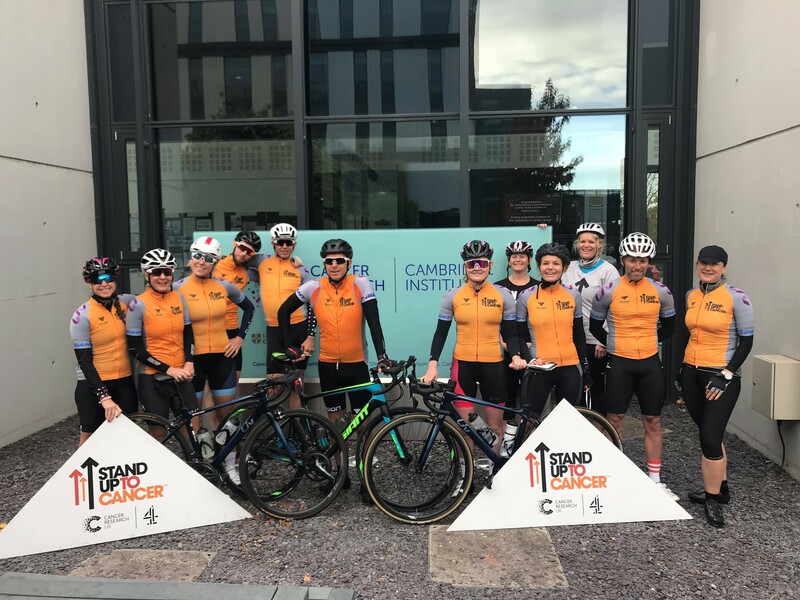 Today (Friday 12 October) we welcomed the Stand Up to Cancer cycle team and waved them off on the last leg of their epic 500-mile cycle ride from Glasgow to London to raise money for cancer research. 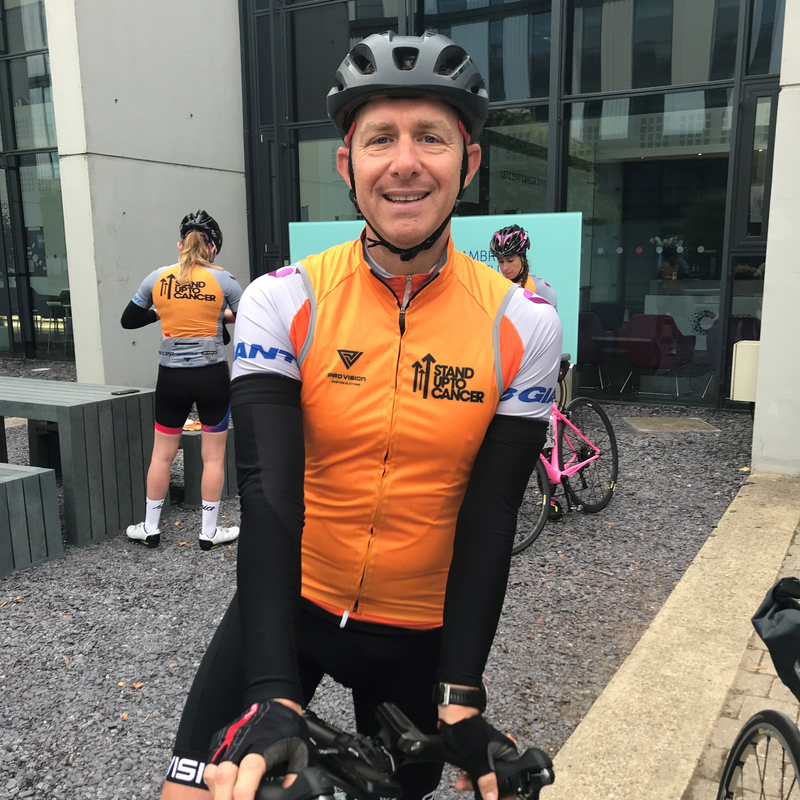 Simon Ledsham, 49, who works for Cancer Research UK as director of communities, his colleague Debbie Bradley, and three others make up the core team of five cyclists who are tackling the full 500-mile Stand Up To Cancer Cycle Challenge. 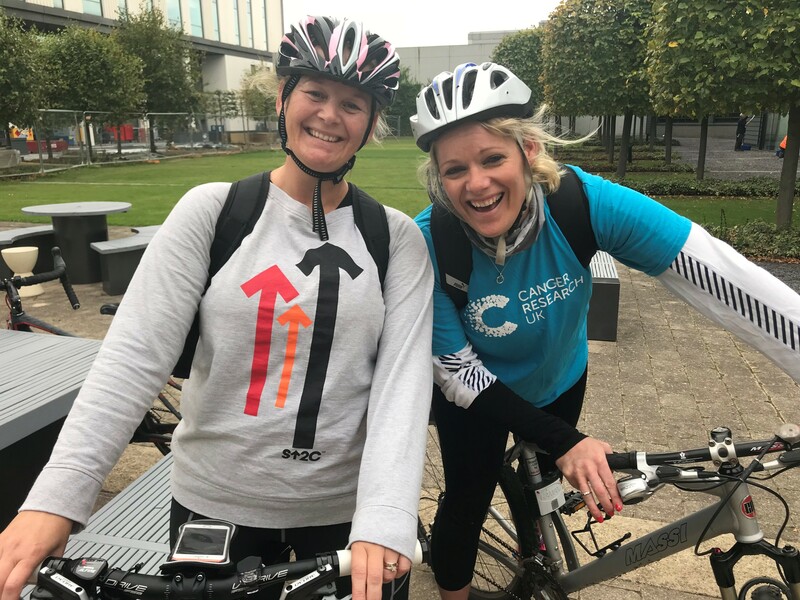 The team set off from Scotland on Sunday morning to cycle to London via Cancer Research UK’s key research institutes to highlight the vital role science plays in helping more people survive the disease. They started at the Beatson Institute in Glasgow, and have stopped off at Manchester Institute, Birmingham and this morning they set off from the CRUK Cambridge Institute and will finish at the Cancer Research UK headquarters in Islington later today. Simon is undertaking a series of fundraising challenges in an attempt to raise £10,000 for Stand Up To Cancer. He has previously climbed Mount Kilimanjaro, had a go at stand up comedy and performed on stage dressed as David Bowie for a charity version of Stars In Their Eyes. Simon and Debbie decided on the 500-mile cycle challenge earlier in the summer after asking for ideas for raising funds and awareness. As well as visiting research centres, the team have also called at a number of Cancer Research UK shops to meet supporters and volunteers. Simon said: “My inspiration comes from the amazing people who fundraise tirelessly for us and who are prepared to put their mental, physical and emotional strength to the test. For each leg of the journey the core team have been joined by local colleagues and supporters, and most days they have pedalled more than 100 miles tackling tough terrain, wind and driving rain along the way.